Sugar and spice and everything nice. We adore our young dancers at Kick. Little girls and boys as young as 18 months to 4 years old enjoy their first dance experience with us. They’re wide-eyed and eager to bounce to the beats and sway to the songs of Frozen. Sweet tutus with sparkles make us smile! But….dance class can do more for your child than just help you to capture those adorable Instagram moments. When children experience the magic of dance class early in their developmental years, they build a base of fundamentals that carries them throughout life. Technically perfecting a child’s Plié or Pirouette is not our most important goal when they first start, instead we want them to gain a love of dance, develop strong bodies, confidence, and make life-long friends who share their passion for performing. According to the National Dance Education Organization, dance is “basic to learning,” and provides a very natural method to learn expression and develop physical, emotional, and social skills. So it’s no surprise that starting children in dance at a young age can increase the benefits and skills learned. Increased physical and cognitive development. Children can flex their muscles and gain strength and endurance through dance. “For babies and toddlers, the creative movement offers a range of experiences that facilitate natural, easy play and proper development of movement, coordination and creates building blocks for future learning,” said Vanessa. This means the ideal time to get involved in dance is at a very early age. “For preschoolers, two and a half to four years old, dance is an essential part of the educational experience,” said Vanessa. Dance not only improves physical development but helps to foster social skills as well. Through social encounters, interaction and cooperation, dance works to teach important life skills. “Dance allows children to learn how to work as a team, how to take turns, how to develop relationships, and how to follow directions,” said Vanessa. These skills are easier to learn at a young age, which is why it is important for children to become involved in dance early on. “Dance is amazing for self-esteem!” said Vanessa. “It allows for recognition of children both as an individual and as part of a team. It’s amazing to see the year-long development and learning from their first day of class to their first performance on stage.” By learning to become comfortable in their skin, young dancers can work to understand their bodies and often develop a more confident attitude. This confidence lasts a lifetime. By learning ballet early, children experience the foundation of dance, which can help maintain steady interest in dance for years to come. “We love to see our dancers learn this core foundation, as well as see them learn tap for rhythm and musicality, jazz for energy, and performance and creative movement for confidence, creativity and body awareness,” said Vanessa. 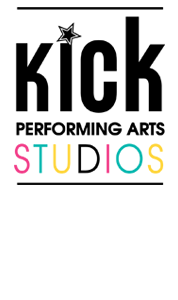 Kick Dance Studios combines styles into a few of their classes to allow for maximum growth. These classes include Tap-n-Twirl, blending tap and ballet, Shake-It-Up Hip Hop and Ballet Combo and Princess Ballet, blending classic ballet and princess fantasy. Registration for classes is open now. Click here to register your young dancer today!